This review is late as hell, but I am just damn lazy!! When I heard about Joe Lynn Turner’s new Sunstorm album I couldn’t have been more excited! 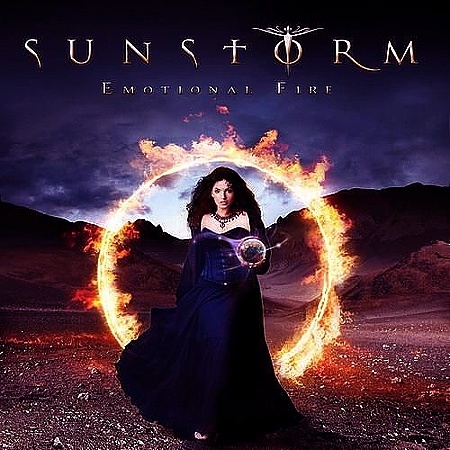 Sunstorm’s 2007 self titled album and 2009’s “House of Dreams” are among my all time favorite’s and I feel the kind of Arena Rock style that JLT put’s out with Sunstorm is perfect for his style and voice! That being said, I am not into “Emotional FIre” as much as I am the last two releases. It is definitely a good album and will please any and all fans of JLT and AOR in general. The songs are in the same vain and of the same quality writing and production as the previous albums and I believe that to be the problem, everything is great, but nothing is different. The album itself is composed of a 11 tracks, 8 are new and 3 are Michael Bolton / Diane Warren compositions that JLT sang back-up vocals on. 2.) Emotional Fire– The first of the covers, originally performed by Cher and written by Michael Bolton and Diane Warren. I love the original Cher version of this song to death. (Don’t judge, she rocked in the 80’s!! ), I like this version as well, but could have maybe changed the arrangement around. 3.) Lay Down Your Arms– Dark and Moody and a little modern. Not what I expected and a surpirse. 5.) Wish You Were Here– One of my favorite tracks on the album, pitch perfect AOR! 6.) Torn In Half- Best track on the album! Great Rocker and good FU song! 7.) Gina– Third and last of the Bolton covers and one of my favorite Bolton tunes. Same problem as the others, like this version but could have updated the arrangements otherwise it just causes comparisons with the Bolton version. 8.) The Higher You Rise– Great uplifting rocker! Good Warrior song, throw it on your IPOD running mix! 9.) Emily– Big keyboard driven rocker, plays to my love of songs with girls names! 10.) Follow Your Heart– Love the Cheese!! Definitely can imagine this on an 80’s movie soundtrack!! 11.) All I Am– Closes out the album with a great power ballad. Great song and perfect album closer.